It rained lightly most of the drive to Exmouth and I watched the (once white) pastic pipe on the camper (the one that holds our tent poles) go from dark brown mud, to a warm red baked on Gibb dust and back to white(ish) in the rear view mirror as we went. We arrived in Exmouth to find it under water! There were kids playing in the large open drainways on the side of the road and they were riding their bikes into them and coming back out looking like they’d been swimming! We stopped at the Information Centre to book ourselves a Whale Shark tour and get some information on the town before heading to the laundromat to dry our wet clean clothes. While we waited for them to dry we did some grocery shopping and found a dive shop with a bargain bin where we grabbed Miss6 some pink snorkel gear and then to the bakery for some hot pies for lunch. Back in the car with our dry clothes we headed out to Cape Range National Park where we’d booked three nights at Ned’s campground. The rain stopped long enough for us to set up the camper and awning and walk to the beach for a quick look at the views and potential sandcastle making. We headed back to the van to make dinner and play some cards. I’d bought a pack of Uno cards in Exmouth to keep us entertained in the van in inclement weather. It was Miss6 first foray into Uno and she wasted no time in mastering the game and kicking our butts. Poor Master14 couldn’t win a game that night and went to bed an unhappy chappy! We tried for a sleep in the next morning (ha ha why is it that on mornings we need to be up at the crack of dawn I feel like I could sleep all morning and those days we have no alarm I’m awake at the crack of dawn??). After brekki we headed to the Discovery Centre where we found some of the local birdlife had made themselves a home way up on a neighbouring telecommunications tower – not sure what happens when the tower needs repair though this could explain why there’s never any Telstra service in National Parks? They had some great displays here and the kids and I wondered around looking at them and watching a DVD before heading to their shop to hire snorkels and flippers for the day. We headed down to Turquoise Bay as it was supposed to be the more kid-friendly site but the waves crashing into shore were scaring Miss6 off giving snorkeling a go and although Master14 and I gave it a quick go the underwater treasures were too far offshore to leave Miss6 alone on the beach so we packed up our stuff and headed to Oyster Stacks. The tide was high and though the waves were still crashing on the rocks, the coral and fish were right at your feet. Miss6 put on her floaty jacket and held my shoulder and after a rough start trying to get our flippers on in the water as waves kept crashing over us, we were soon floating over the reef and enjoying the views. If Miss6 thought too much about the shore, she’d worry we weren’t swimming in the right direction and heading out to sea but as soon as she put her face back in the water she was distracted by the myriad of colourful fish and coral. 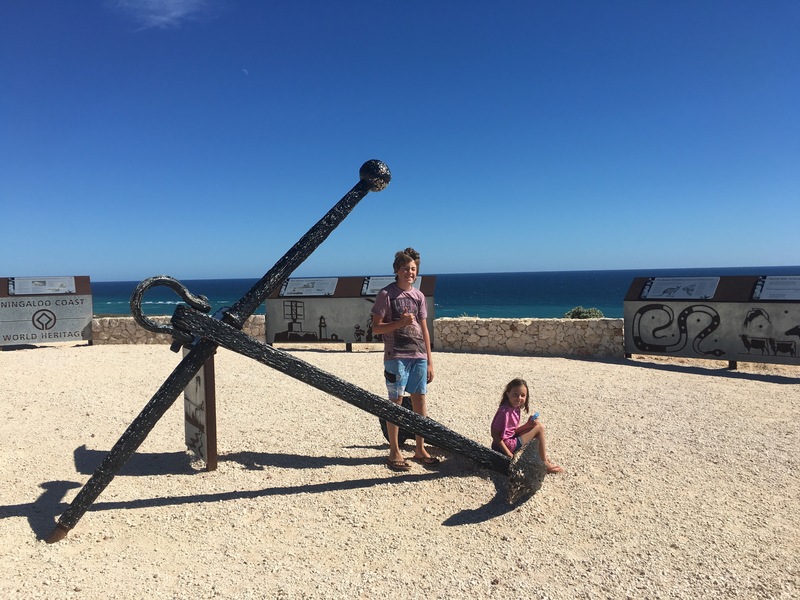 We saw rainbow coloured fish, stripy fish, a bright blue massive starfish and the kids saw a giant clam plus loads of other fish (don’t you love my technical knowledge of Ningaloo Reef sea-life?) among some pretty amazing coral (and yes, I’ve been to the Great Barrier Reef – this place is so much more accessible, affordable and just as beautiful). 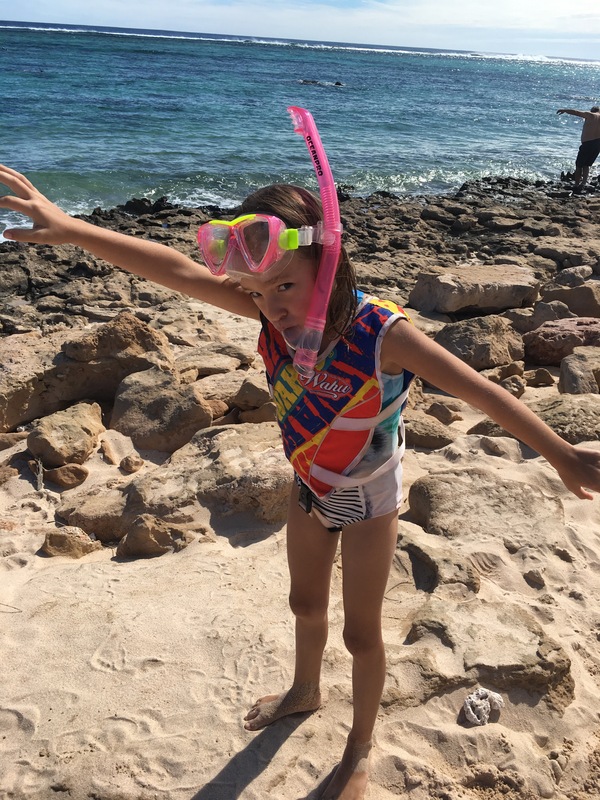 Master14 and I kept getting water in our hired snorkels but Miss6 had the best gear thankfully so she could really enjoy it without getting scared off. The invading water eventually got the better of Master14 and his final snorkel was a pretty crappy one so he swam back to shore a pretty glum teenager. The kids had had enough after a few turns out in the water so I went for one final snorkel on my own and ended up drifting way out before heading back to shore to pack up and return the hire gear to the Discovery Centre. 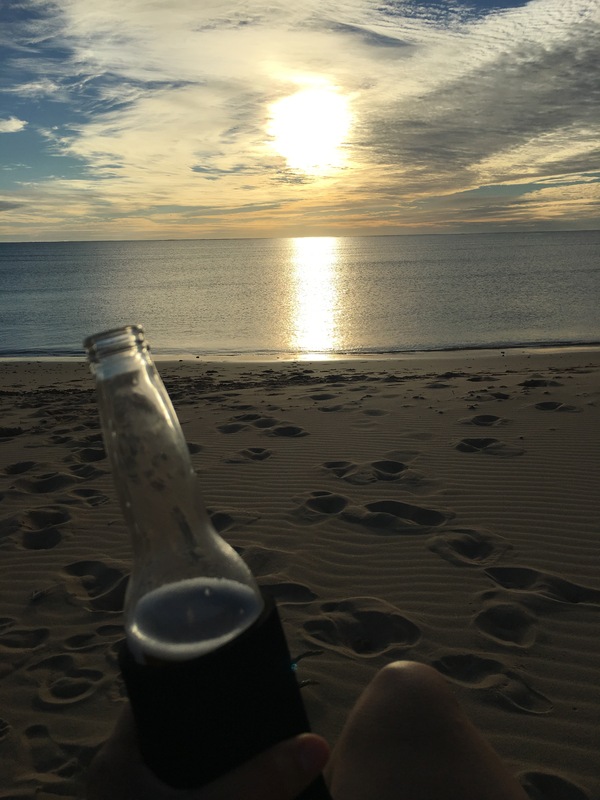 After a very late lunch and some Uno (Master14 wanted retribution for his flogging the night before) we headed to the beach with a cold beer and camp chair to watch the sun slowly set. While on the beach we chatted with some others about what they’ve been up to while in Cape Range NP. One couple had been on a Whale Shark tour with the same company we were going with the next day and thought they were amazing so we were pretty happy to hear that. Another guy told the kids about the ghost crabs on the beach after dark so after we ate dinner and it was dark enough, we grabbed the torches and headed back to the beach to see what we could find. As Master14 turned on his torch he jumped a mile in the air as he nearly found himself standing on a rather large ghost crab scuttling across the sand! It turned out to be one of the only large ones we saw so we headed back up the road to the other section of beach to see if we could find more there and Miss6 and I managed to spot a shooting star on the way. 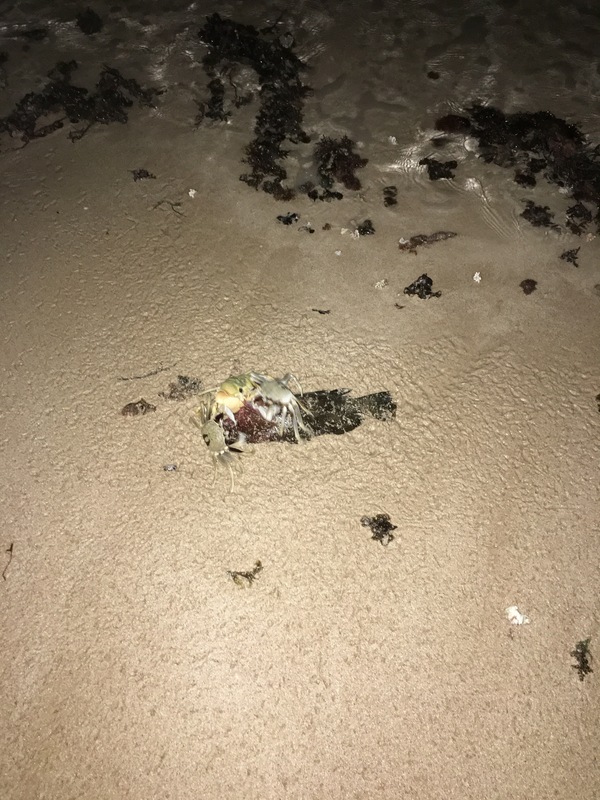 This section of the beach had heaps more ghost crabs scuttling about and even a large group of them feasting on some scraps of fish so we could get up pretty close to them without them running off. We went to bed that night excited for our big day on the boat the next day and pretty happy with the day we’d just had today. 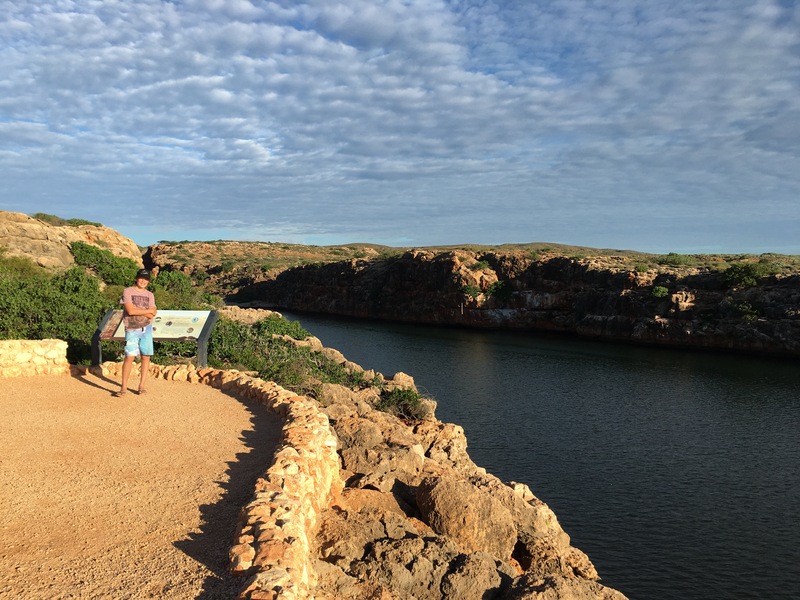 As we were staying at the National Park we met our tour company at the boat ramp while the rest of the tour group was shuttled on a mini bus from Exmouth. 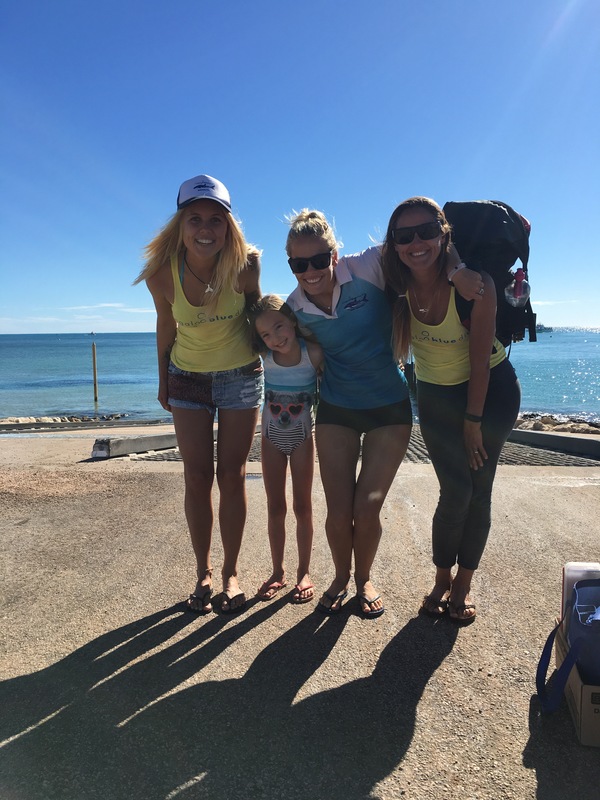 We were greeted by Amanda and Naomi and then walked to a little boat where we met our skipper Brad who took us all out to the bigger vessel we’d be travelling on for the day. 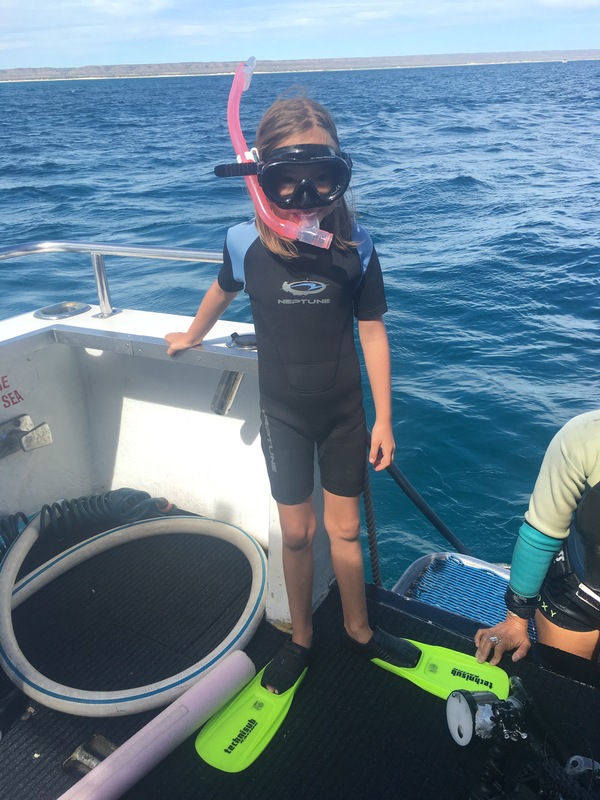 The crew handed out wetsuits, flippers and snorkel gear and I must admit, small children look so cute in wetsuits – I remember Master14 in a wetsuit on the Great Barrier Reef when he was just five and Miss6 certainly looked just as cute in her getup this time around too! 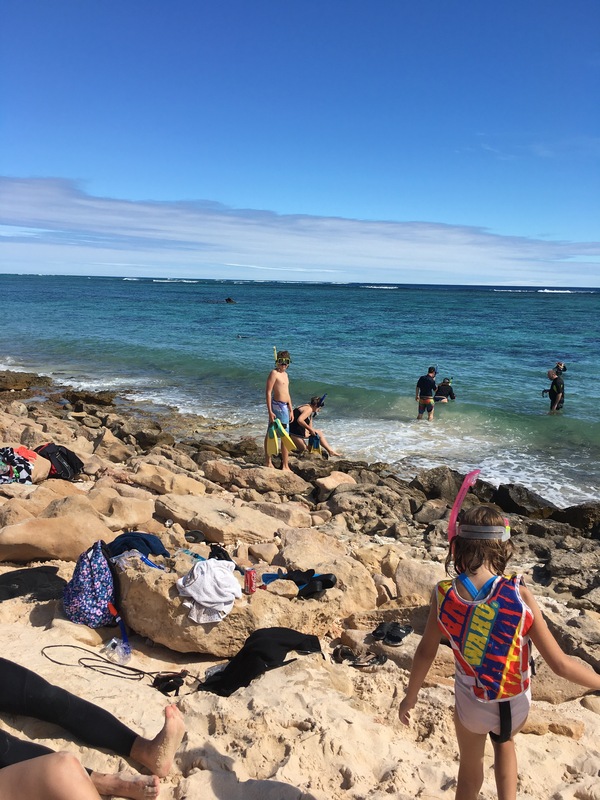 We stopped off for a snorkel among some pretty fish and coral while the crew figured out who were the more confident members of the group and how to group us together for the big adventure later on. We were grouped with another family with five kids and were funnily enough told we were the more confident looking of the two groups. We were expecting the spotter plane to be flying overhead shortly to find us a Whale Shark to head to but our experienced skipper managed to find one without the plane and much quicker than expected so it wasn’t long before we were shuffled to the back of the boat and heard the ‘go, go, go!’ command to jump in the water and line up with Amanda. Miss6 panicked at this stage and didn’t want to jump in so by the time I gave up encouraging her, the rest of our group had already gone a fair way out. I started swimming to catch up and saw Amanda pointing down so I put my snorkels under the water and was confronted with the giant head of a Whale Shark looking at me and swimming towards me only metres in front of me. It took my breath away for a moment before I remembered we weren’t supposed to be in front of it so I swam to the side and then swam alongside it with everyone else. We stopped and let the second group jump in and have a turn while we returned to the boat. Naomi had made quite an impression on Miss6 and encouraged her to go out for a swim next time and Amanda asked her if she would like to swim with her and a noodle to see the Whale Shark. 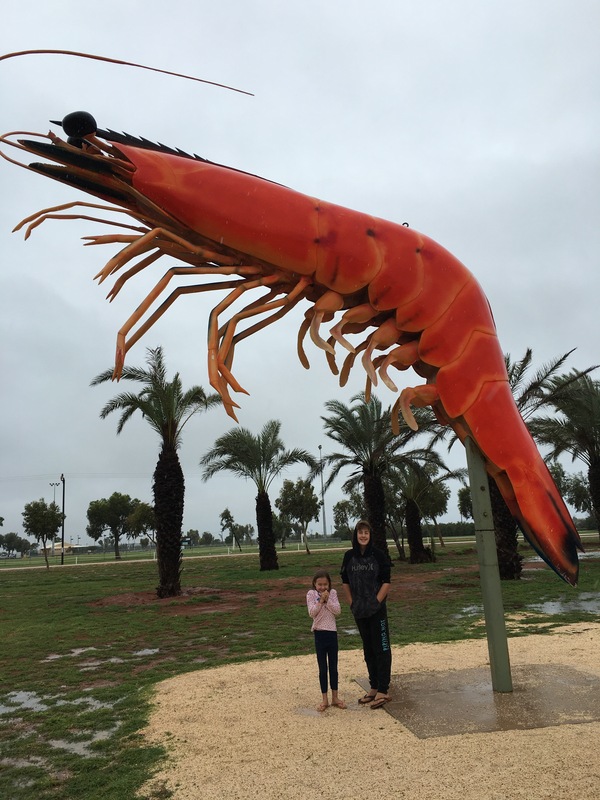 This made Miss6 very happy and far more confident so the second time we got the instruction to ‘go, go, go!’ she was in the water with Amanda before anyone else and swimming alongside the largest fish in the world. The Whale Shark was swimming very close to the surface so I’d actually seen it from the boat before we hopped in the water the first time and we got to see it up very close and in very clear water – it made me very happy knowing that Miss6 braved the experience and got to see such a beautiful creature up so close. She didn’t get back in the water to swim with the Whale Shark after that but Master14 and I jumped in for round three before we took the boat to another area of the water to let another boat have a turn. At this other area of water, our skipper had found a large pod of Spinner Dolphins who were putting on a show for us. While we were watching these amazing and agile swimmers, a humpback whale and her calf appeared above the water only a hundred metres or so away from the boat. It was such a spectacular sight to see these animals so close that it almost seemed disappointing to have to leave and go back to the Whale Shark. 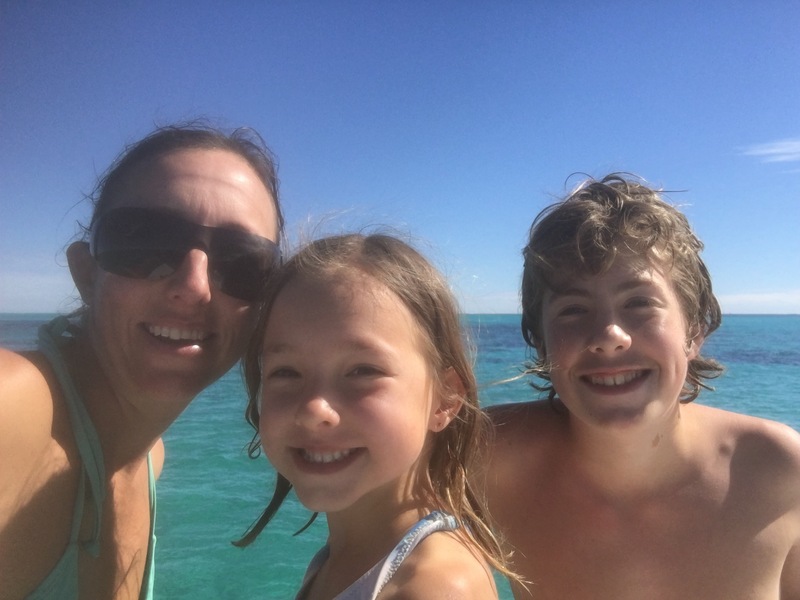 Master14 and I had our fourth swim together with the Whale Shark but by the end he was a bit tired so he didn’t do the fifth swim – the water was pretty rough out there to be swimming in though it was calm enough from the boat. The last two swims weren’t as close or clear as the first three as the Whale Shark had started to swim a little deeper below the surface so it was harder to swim alongside. While we all marvelled at what an incredible morning we’d just had, the crew dished up a massive delicious lunch for us and we got to have another look at the Spinner Dolphins and Humpback Whale. 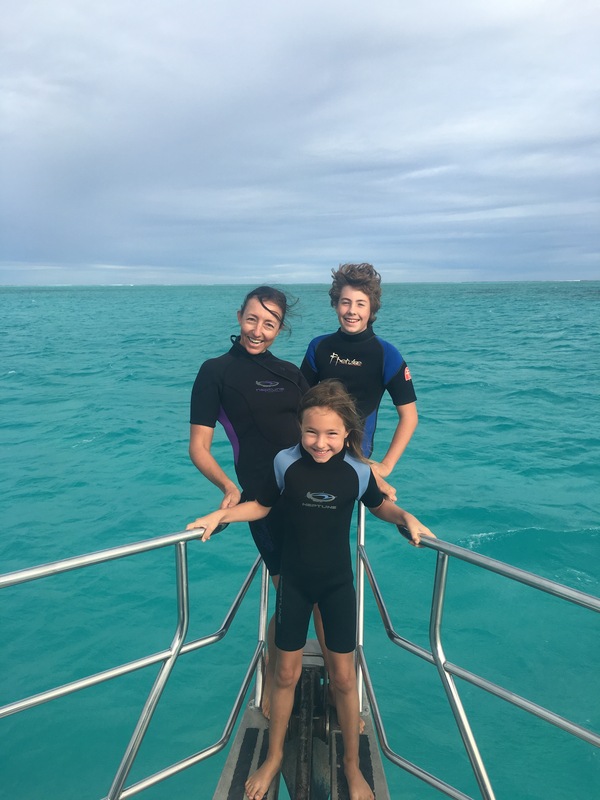 We were then lucky enough to find a lone Bottlenose Dolphin happy to show off for us jumping out of the water and even hitting the front of the boat as it jumped – right near where Miss6 was standing – she was rapt. It wasn’t much longer that we found another small pod swimming around very graciously. We soon realised that there was one female and five males and they were actually in the midst of mating. Miss6 and another little girl were standing next to the skipper at this point so lucky for me he could explain that one to them! We knew this sort of day didn’t happen very often as even the crew had their cameras out for all of the excitement around us. We stopped for a final snorkel at a section of the reef that the crew hadn’t been to before. The waters out here are so crystal clear and that beautiful turquise and blue that you think only exist on the brochures. Miss6 went out with a noodle and her new BFF Naomi and got to see some really cool things under the water including an octopus. Master14 and I went for a snorkel together and it was lovely holding hands under the water so we didn’t accidentally float off in opposite directions to each other. Back to the boat and back to shore after a long and exciting day with the crew from Ningaloo Blue. It was only 3pm when we were dropped at the boat ramp so we drove out to Brooke beach for a quick look (seems I’ve really made my mark on this country!) before heading to Yardie Creek for a hike into the gorge. We only went part way into the gorge as we didn’t have our runners on only thongs and the track was getting a bit rough. The views were gorgeous though and we’ve added this to our growing list of ‘things to come back to’. We drove back to camp dodging heaps of Kangaroos and slowing down to pass them so as not to startle them – though some impatient idiot in a Mercedes didn’t like me slowing down for them and overtook me when I’d slowed to 40km/h to pass five of them on the side of the road! 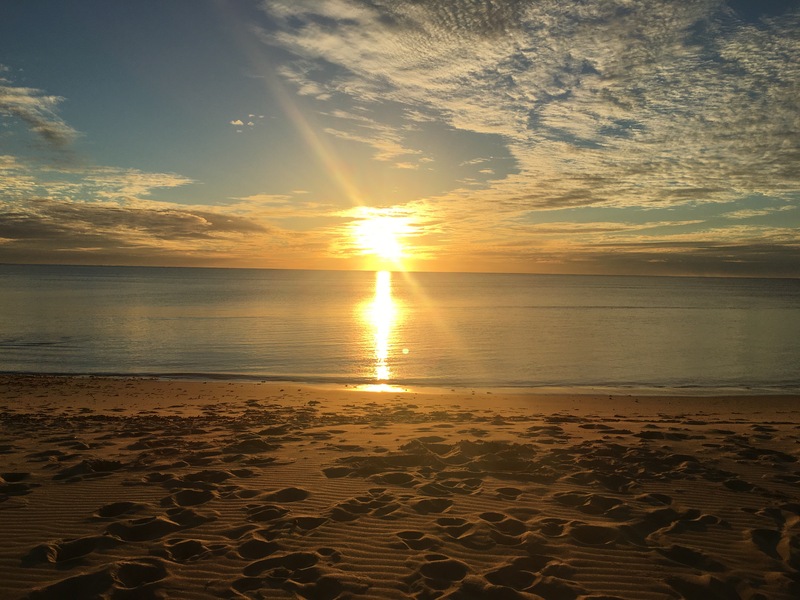 We got back in time to watch another beautiful sunset on the beach where we found the couple who’d also swam with Ningaloo Blue – they were happy we’d had such a great day though they didn’t know how we could’ve added a hike to the end of such a big day. While packing up the next day our KC family friends popped in on their way to the boat ramp to say hello (possibly for the last time as they still had one more night at the National Park). We were almost packed up when a lady, whom I recognised from on teh beach at sunset the night before, came over and said hi. She asked if I was travelling on my own with the kids and when I said yes she asked for a hug. 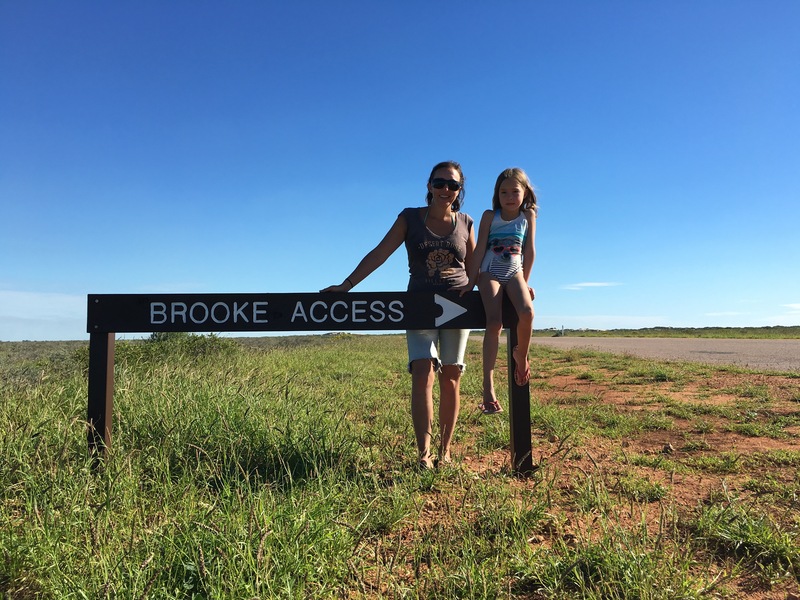 She too is travelling alone with two kids (for two years lucky things) and said she’d hug the first single mum she found on the road – I was the lucky one though it’d taken her a year to find me! 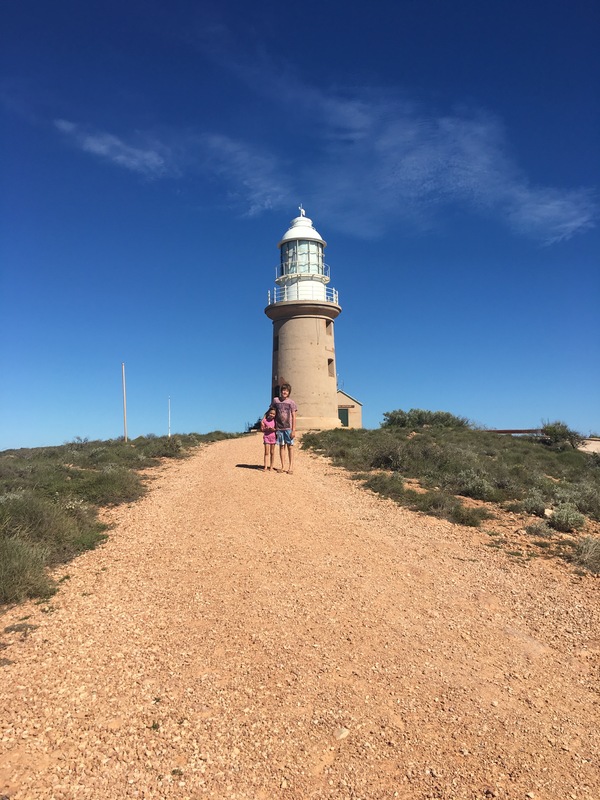 We headed off to Exmouth via a quick stop at the Turtle Sanctuary (which seemed to just be an informative shelter/display) and then the lighthouse. The drive up and down that hill was a little precarious towing a tonne and a half but the views and interpretive displays and information up there were great. We finally got to Exmouth and my phone reception kicked back in (for all its talk about covering 90% of the population, Telstra has some pretty massive black spots in most parts of our trip). I had a message from the local auto electrician to say they could fit me in today at 1pm to check my car out. To be safe, I booked us in to a local caravan park so that if my car needed anything time consuming done to it, I wasn’t driving to our next stop in the dark. Turns out despite being checked in Broome, I needed a new battery so after half an hour and a small fortune later (plus a little extra as there was an amazing sweets shop next door that we had to buy from!) we headed to the caravan park to set ourselves up and hit the hot showers. When I checked in though I was devastated to read a sign that said ‘due to a gas shortage there are no hot showers available’. 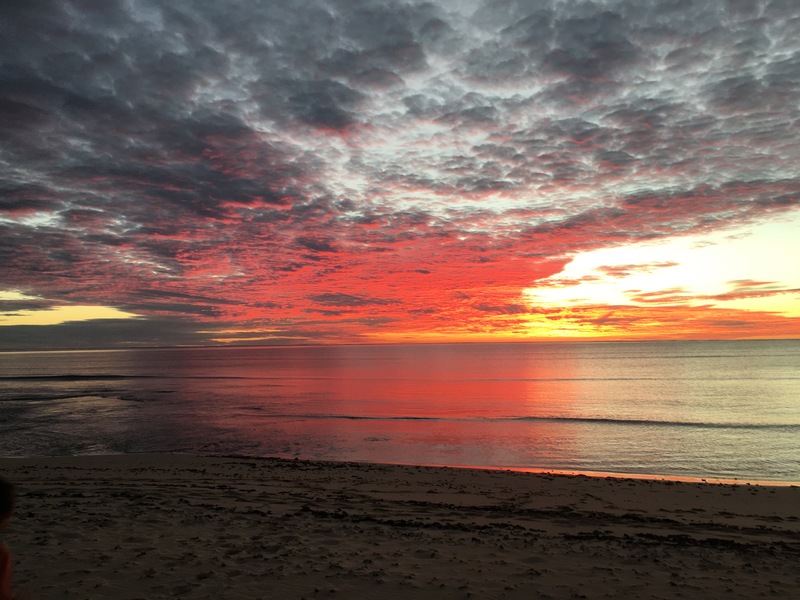 It was a relief to know that the sign was now null and void as they’d just completed repairs and I could have a hot shower and wash my hair – it had started to feel like I was growing dreadlocks from all that salt water and wind in my hair.